Although mountain lions were part of Nebraska’s native fauna, they were extirpated by the end of the 19th century. Despite annual reports since the 1950s, no confirmed sighting was made in the state until the 1990s. 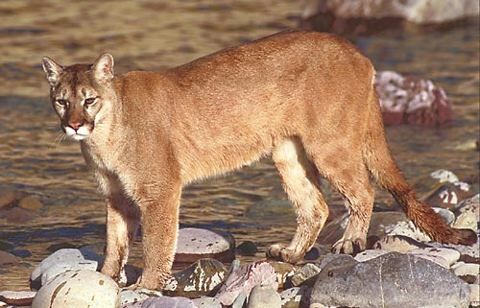 In 1991 a deer was found killed by a mountain lion. Shortly after an adult mountain lion was shot by a hunter near Harrison in Sioux County. Mountain lions in Nebraska are part of the larger population that spans all Western states. These animals move freely between Nebraska and neighboring states. Particularly South Dakota and Wyoming. The most recent population survey of mountain lions in the Pine Ridge was conducted in May and June of 2014. The survey estimated a population of 22 animals in that specific area. However, population estimates only apply to a specific point in time. All populations continually change in size due to births and deaths. As well as animals that enter or leave the area. It is not accurate to only subtract deaths from a population estimate. You must also account for additions through births and animals entering or leaving the area over time. We now have breeding populations in three areas: the Pine Ridge, Niobrara River Valley and Wildcat Hills. Typically we have a few mountain lions roaming other parts of the state as well. Mountain lions occur in a variety of habitats, but prefer rougher, wooded areas. Prey abundance, especially deer, is probably the most essential component of mountain lion habitat. The Nebraska Game and Parks Commission is interested in verifying mountain lion observations in Nebraska. 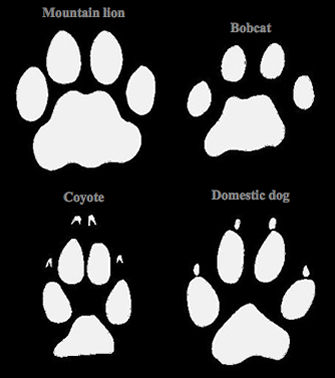 If you have evidence of a mountain lion (such as video, photo, tracks, feces, hair, etc.) please call your nearest NGPC office. They will investigate the observation. Consult the track comparison shown below to make sure the tracks you found belong to a mountain lion.. Cover the tracks with buckets to prevent destruction and inform the NGPC. If you take photos of sign, please include a ruler or pen in the picture for size reference. If you encounter a possible mountain lion kill (deer or livestock), please leave the kill site undisturbed. Inform your nearest NGPC office immediately. They will then attempt to record a possible revisitation and to identify the predator. A combination of understanding and tolerance will allow us to coexist with mountain lions. Also preventing us from repeating the mistake of extirpating this magnificent feline from Nebraska once again.